Kolbjorn Barrow is a Nordic ruin on the island of Solstheim, located in the Hirstaang Forest. In the Merethic Era, the great enchanter Ahzidal fled to Solstheim from Skyrim. Having been driven to madness by his study of Oblivion, Ahzidal was betrayed by his fellow Dragon Priests and disappeared from history. Through unknown means, he was sealed within Kolbjorn Barrow, along with his most powerful relics. The Skaal were the only ones to remember this. Hermaeus Mora chose to hide a Black Book titled Filament and Filigree deep within the barrow. In 3E 427, draugr from the tomb attacked a seer named Geilir the Mumbling in his dwelling on the western coast of the island. The draugr took "Oddfrid", a seemingly magical skull that told Geilir of the future, and returned to the barrow with it. Geilir asked the Nerevarine to retrieve the skull, and in return provided a reading of the future. After the Red Year of 4E 5, the southern half of Solstheim began to be subjected to constant falling ash from Red Mountain. In time, the ash buried Kolbjorn Barrow completely. 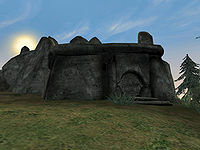 In 4E 201, a financier from mainland Morrowind paid a Dunmer named Ralis Sedarys to recover the Relics of Ahzidal from the ruins. However, Ralis was surprised to arrive on the site and discover that the place was buried in ash. He attempted to excavate the ruins single-handedly, but it was no use. He then partnered up with the Last Dragonborn, who provided the necessary funding to hire miners from nearby Raven Rock. The excavation required several stages of funding, as the hired miners and mercenaries were repeatedly slaughtered or scared off by the awakened draugr within. Throughout the dig, Ralis slowly began to lose his mind; at first, he heard only mocking voices, which eventually coalesced into the voice of Ahzidal himself, who had placed a spell on him. Ahzidal told him of the layout of the ruins and instructed him to excavate the inner chamber, where Ralis then began to sacrifice the souls of the miners to speak with his "master". He then attempted to summon Ahzidal, but the ceremony was interrupted by the Last Dragonborn, who defeated the undead Dragon Priest. The spell was broken, but it is unknown if the Dragonborn spared Ralis's life or not. Regardless, many of Ahzidal's relics were taken from the ruins, as well as the Black Book.